Candidate Barack Obama had no better buddy on the 2008 primary trail than Missouri Sen. Claire McCaskill, who was feared – and a little hated – by Hillary Clinton’s campaign for being Obama’s most effective female surrogate. McCaskill still likes Obama, but like many other former high-profile Obama surrogates from 2008, she’s not expected to reprise her starring proxy role in 2012. McCaskill has publicly parted ways with Obama on several major issues, including entitlement reform, and needs to tend to her own challenging reelection campaign, made all the tougher by controversy about reimbursements for flights on her family’s private plane. Isn’t communicating about himself by himself what Obama loves to do best? Why does he need others to do that….oh, right, sorry, narcissism. Obama wants to also hear others talk about how great he is. But, a good many Democrats, especially those up for re-election come 2012 (and in the previous 2010 midterms) realize that it might not be the best idea to link themselves so close to Obama for a variety of reasons, mostly about the stuttering economy, Obama’s incompetence on it, and his unpopular agenda. And the role of surrogates in 2012 will be fundamentally different than last time – less about introducing Obama to the public and more about explaining health care reform, the stimulus, two-and-half wars and the flagging economy to anxious voters. Did they just refer to Libya as half a war? Anyhow, Obama has quite a bit to explain, very little of it good. Expect much nose holding by Obama supporters as the 2012 election get closer, as they try and explain away what’s happened since January, 2009. 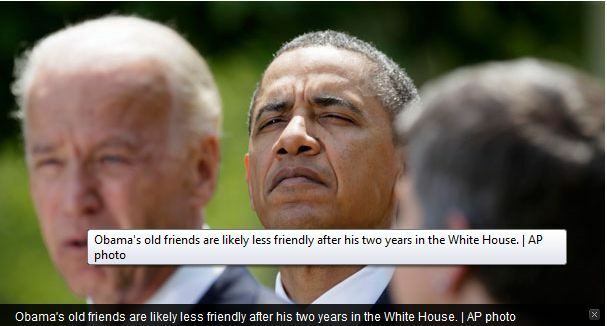 Interesting how The Politico uses a typical shot of Obama looking snooty.